Peg and Don Hambrick’s neighbors include other couples, families, single professionals … and about 40 fraternities. Traditionally, that mix of permanent residents and fun-loving students in The Highlands has caused clashes over late-night noise, trampled lawns, and inebriated revelers. In 2010, the Highlands Civic Association launched the Neighbor to Neighbor program to help head off conflicts by pairing families with fraternities so they can get to know each other better. Paired with Sigma Phi Epsilon for six years now, the Hambricks drop off cookies, invite SigEp leaders for dinner, and say “Hi” when they walk past the fraternity. One of those boys is Tim Sonier, SigEp president last year and the Interfraternity Council’s vice president of community relations. In turn, Sigma Phi Epsilon invites the Hambricks to parent and alumni events. Having grown to 28 family-fraternity partnerships, the Neighbor to Neighbor program is one of many ways town and gown work together in State College. Businesses, governments, university officials, and residents recently have taken a more proactive approach to the marriage between Penn State and the local community. In his 2016 book, The Optimal Town-Gown Marriage, Stephen Gavazzi writes that, just as with a long-term relationship between two adults, a healthy town-gown partnership takes a great deal of ongoing work. The marriage metaphor is a natural one for Gavazzi, who is a professor of human development and family science at Ohio State and director of university’s Mansfield regional campus. He also is a Penn State alum (BA, psychology) and was born in Bellefonte when his father was a graduate student at Penn State. Gavazzi says that many town-gown marriages — including that between State College and Penn State — begin with a traditional “live and let live” relationship, with campus and community members ignoring each other as they pursue separate goals. Other relationships are conflicted, with town and gown representatives unable to resolve their differences. The most desirable relationship, according to Gavazzi, is the harmonious type, in which campus and community partner across a wide range of undertakings and expend significant effort in strengthening the partnership. 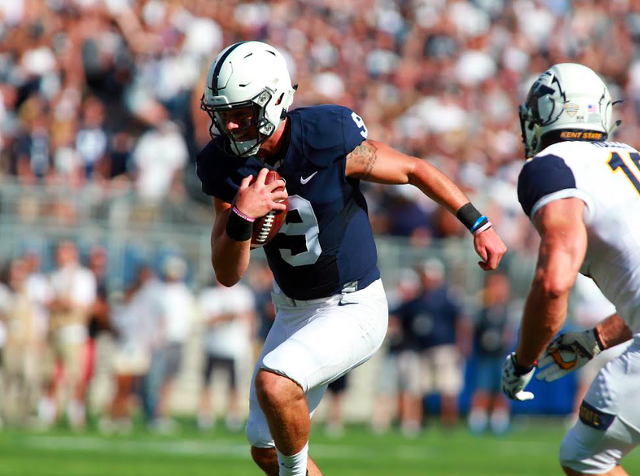 He believes the State College-Penn State relationship is trending toward that end of the spectrum. Across the country, institutions of higher education and the communities in which they reside are taking a more proactive approach to their relationships. The International Town&Gown Association (ITGA) was founded in 2008 to address challenges, emerging issues, and opportunities; both Penn State and the Borough of State College are members. Fountaine became State College borough manager in 2003. At that time, he recalls, “There was a lot of communication already with Penn State.” That communication has continued, he says, but town and gown have both committed additional resources and communication to enhance quality of life in the downtown and neighborhoods shared by permanent residents and students. For example, he and Damon Sims, Penn State vice president of student affairs, are both leaders of The Partnership: Campus and Community United Against Dangerous Drinking and the State Patty’s Day Task Force. Last year, the ITGA named Penn State and the State College Borough a joint recipient of an ImpACT Award for those collaborative efforts in diminishing the negative effects of State Patty’s Day on the local community. According to the borough manager, the biggest recent shift in town-gown relations has been a new emphasis on cooperation in economic development. The goal is to grow private-sector business and employment in a region where public-sector jobs — led by those at the university — long have dominated. In May 2015, Penn State president Eric Barron and Chamber of Business & Industry of Centre County president Vern Squier signed a memorandum of agreement for the two entities to work together toward building a nurturing and collaborative environment in which professionals, entrepreneurs, and businesses can thrive. One of the early results of that partnership was the announcement this summer that United Kingdom-based Morgan Advanced Materials will establish a research and development center at Innovation Park at Penn State. Last spring, LaunchBox, a signature program of the statewide Invent Penn State initiative, opened its Happy Valley LaunchBox new-business accelerator on South Allen Street, across from the municipal building. Already, 15 teams have participated in the 10-week business startup program, with ideas ranging from breath-controlled video games to a buffering agent aimed at reducing fertilizer pollution to a social platform designed to facilitate sport pickup games. The result, she says, will be more jobs, more internships, and a better local economy. In addition, LaunchBox offers free public co-working and conference-room space weekdays from 8:30 a.m. to 4:30 p.m., as well as legal advice and more through Penn State clinics and support centers. Information technology and marketing clinics are expected to open there this fall. In another entrepreneur-oriented effort, from November 13 to 17 this year, the CBICC and Penn State are partnering in Global Entrepreneurship Week, with events downtown and on campus. Each day will feature a theme such as social entrepreneurship or women entrepreneurs, with events including networking, workshops, and “flavor flights” of food from local entrepreneurs. Two years ago, Penn State’s Office of Student Affairs and the Borough of State College partnered to establish the jointly funded Community Engagement Office to improve local quality of life and minimize nuisance activities, particularly in the three neighborhoods closest to campus — Highlands, Holmes-Foster, and College Heights, says Centrice Mulfinger, community-engagement manager. “We try to bring together our long-term residents and our student residents to practice what being a good neighbor is all about,” she says. The office’s two major annual events are LION (Living in One Neighborhood) Walk and LION Bash, both in August, when most students return to town. 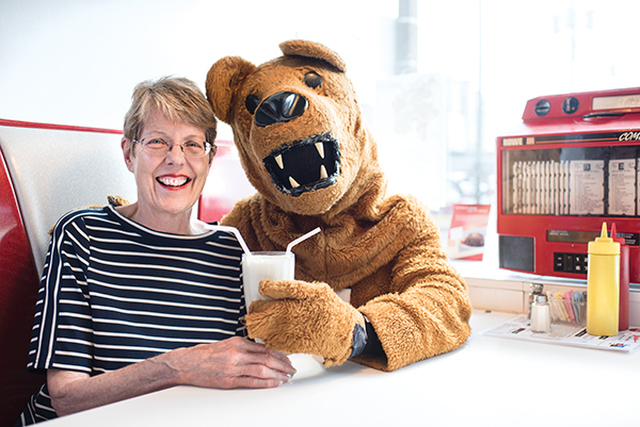 In LION Walk, Penn State and State College representatives — including Barron and State College Mayor Elizabeth Goreham, as well as the Nittany Lion mascot — walk through neighborhoods, knock on doors, and talk to residents about being good neighbors. LION Bash brings together student groups, university departments, and community organizations for “engagement stations” where neighbors can play word games, putt a hole in one, take selfies in the back of a police cruiser, and more. One of the most recent steps toward better town-gown relations was Penn State’s creation in 2015 of a new position: director of local government and community relations within the Office of Governmental Affairs. Filling the position is Margaret Gray, formerly assistant director of the university’s Social Science Research Institute; she also sits on the Centre Region Council of Governments board as an ex officio representative. Across the country, more and more communities and colleges are becoming proactive in their relationships. According to Gavazzi, in most college towns, it has become impossible to manage town-gown relations by ignoring each other. The first eight plays seemed familiar. One yard rushing, two yards rushing, a five yard reception, a punt. An incompletion, a three yard rush and another incompletion and a punt.